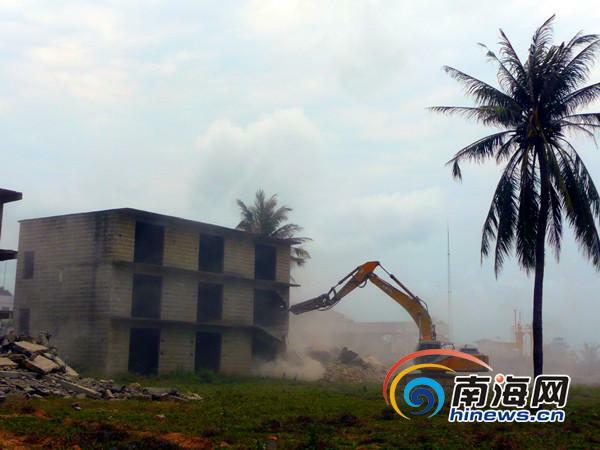 To ensure the project of the Creativity Industry Park going smoothly at Yacheng Town, Sanya law enforcement authorities started their efforts to tear down the 5 illegal buildings in Yazhou Bay on Thursday. Since January, city officials have carried out 4 hammer actions to stop the illegal structures, which most being constructed with poor quality materials, posing great safety risks to local residents. The Creativity Industry Park, consisting of five-themed sectors related to high technology, exhibition and educational training and port logistics, will provide 30,000 jobs in the region. It is estimated that a total of 544 illegal constructions covering an area of 230, 000 sqm are built within the project area. Local authorities will continue their efforts to clear up all of these illegal structures before May this year.